“My fifth grade teacher turned off all the lights and read us ‘The Raven,'” said Pat Lavell. “He made it pretty dramatic, knocking on the desk. It was intriguing for a fifth grader,” Lavell added, visiting the Poe grave at the Westminster Hall and Burying Ground on the corner of Fayette and Greene streets. He’d made the pilgrimage from Pittsfield, N.Y., with his wife, Sarah. “Poe was very dark, a great American writer who mystifies us,” Sarah Lavell said. After a gloomy, stormy day, Poe’s white stone monument had dried in the sun and visitor after visitor walked around it. Poe’s wife, who married him in 1836 when she was 14 years old, is buried beside him. Her name is carved on the south wall: Virginia Clemm Poe, born August 15, 1822, died January 30, 1847. Carved on the north wall of the monument is Poe’s mother-in-law’s name (she was also his aunt, Poe married his first cousin): Maria Poe Clemm, born March 17, 1790, died February 16, 1871. Poe lived with his Aunt Maria and his grandparents, Elizabeth Cairnes and William Henry Poe at what was then 3 Amity Street (now numbered 203 Amity and known as the Poe House). It was 1831 and he had been court marshaled; dismissed from West Point. He’d also just published his third collection of poems, Poems with Elam Bliss, New York. “We read about the mysterious Poe toaster,” Pat Lavell said. A mysterious toaster would place three red roses at the monument; one for Poe, his wife and his mother-in-law. “It was in our newspaper, The Rochester Democrat and Chronicle.” The toaster had appeared for 60 years at the Poe grave on the anniversary of his birth, January 19th. He would drink a toast of cognac, leaving the bottle. In 2010 and 2011 the Poe toaster failed to show. In another section of the cemetery, David Poe, Sr. rests. His tombstone reads: “Patriot and grandfather of Edgar Allan Poe, born in Londonderry, Ireland in 1743, died in Baltimore, October 17, 1816.” Poe Sr. lies near the original site of his grandson’s grave. Samantha McCray came from Rutland, Vt., to see it. 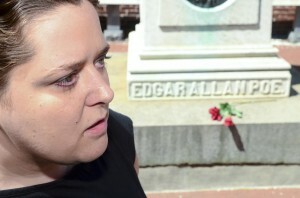 Samantha McCray visits Poe’s cemetery. Poe was placed in an unmarked grave when he died. His monument was dedicated 25 years later and it was paid for, in part, by school children who collected pennies for Poe. The pennies for Poe has been revived to save the Poe House, the victim of Baltimore City budget cuts. Checks are also welcome and should be made payable to: DIRECTOR OF FINANCE, with the words “Poe House” in the memo line of the check. They can be mailed to: Jeff Jerome, c/o Baltimore City Department of Planning, 417 E. Fayette St., Baltimore, MD 21202. Blood was its Avatar and its seal – the redness and the horror of blood. “I liked it because everybody dies,” she said. 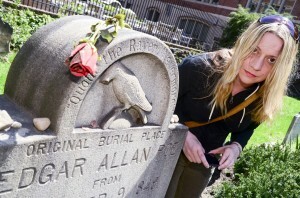 Kelly Ayers (left) and Amanda Hagan pose at Poe’s gravesite. I heard many things in hell. How, then, am I mad? Hearken! and observe how healthily – how calmly I can tell you the whole story. It was a low, dull, quick sound – much such a sound as a watch makes when enveloped in cotton. Standing under the new buds on the branches of an ancient tree that had captured a couple of plastic shopping bags, too high up to remove, Ayers concluded, “I always liked Poe and I knew that they found him on a street not far from here [when he was near death].” She did not know where Poe was buried until she researched it and found the Westminster Burying Ground. Beyond her were three old tombstones that leaned together. They appeared to guard the brick arches under the porch of the Westminster Hall. Black wrought iron filled the arches and more ancient tombstones are visible under the Hall’s porch. There was one “please keep off grass” sign. Most of the Westminster Burying Ground is brick or granite or marble the length and width of a grave. The path throughout the cemetery is the width of nine bricks, placed length-wise, side by side. Beside Poe’s monument is a tomb of Watsons: Robert, William Price, Robert, Jr., Rachel Price Watson, Leah Bond Price, Henry Watson and Caroline Price. The deaths range from 1821 to 1890. The roof of the tomb, made of dark gray granite, is just the right height on which to sit and watch the visitors who walk through the open wrought iron gates. Laureen Russell at Poe’s grave for the first time. Lauren Russell and Thomas Dunklin, newly transplanted to Baltimore from the West Coast, were visiting the Poe grave for the first time. “I’ve always loved reading his poems and short stories,” said Russell. Her favorite was “Annabel Lee,” published in the New York Tribune on the day Poe was laid to rest in the Westminster Burying Ground, October 9, 1849. There are many theories — from Sigmund Freud to Alfred Adler — that say one’s personality is shaped as early as the fifth or sixth year of life. When he was two years old, Edgar Allan Poe’s father disappeared. His mother died a month before his third birthday. Poe was never legally adopted by the Allans, who took him in and though Edgar Allan Poe had a brother and a sister, neither was raised with him. Kristy Hoffman love’s Poe’s writings. 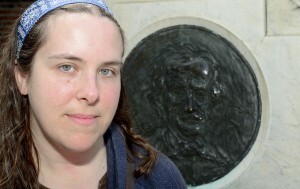 Kristy Hoffman, who journeyed to Baltimore on vacation from Bridgeport, Connecticut, made a stop at Poe’s grave a priority. She cited “Ligeia,” as her favorite story. … it is by that sweet word alone – by Ligeia – that I bring before mine eyes in fancy the image of her who is no more. Poe has rested at the corner of Fayette and Greene Streets, in the shade of what is now the University of Maryland Baltimore City Campus, for more than one hundred and sixty years. Yet, he is still enthralling us, almost two centuries after he first put pen to paper.